YOU'LL WONDER HOW YOU MANAGED WITHOUT US. Owning a high-performance aircraft is a distinction. Operating and maintaining it can be a distraction. When it diverts you from your major responsibilities, it can also be quite costly in terms of both time and money. For your operational efficiency and personal peace of mind, Pinnacle Aviation offers a full spectrum of management services for every facet of your aircraft, from staffing and maintenance to accounting and insurance solutions. You could say we’re high maintenance. That’s because when it comes to your aircraft, safety and efficiency come first. We proactively manage your aircraft to keep it running at peak performance. We provide full-service aircraft maintenance for engines, airframes and avionics. Our skilled, experienced technicians have it down to a science. They remain at your disposal for scheduled and unscheduled maintenance at your home base, and they’re on call round the clock should you need immediate service at a remote airport. Your aircraft may soar but your operating costs shouldn’t. Pinnacle continually finds ways to keep them low while monitoring all financial aspects of your aircraft. Our meticulous accounting staff scrutinizes each expense before processing payment, and tracks every detail for custom budgetary reports. At month’s end, we compile all transactions into a single invoice for your review, reducing your accounting activities to writing just one check. Staffing solutions for the entire crew. Assembling the right crewmembers and maintenance technicians to operate your aircraft is a major undertaking. Unless you leave it to Pinnacle. We locate, identify, interview and screen a pool of superior candidates for your consideration, and train, manage and supervise them after they’re hired. You can be sure they meet our exacting standards, and yours. Our management clients enjoy the benefits of coverage under our own fleet insurance policy. In that capacity, we act as an advocate on your behalf, working with major insurance carriers to ensure you’re receiving the very best coverage at better rates than you would find on your own. We monitor the policy, and revise and renegotiate rates annually. 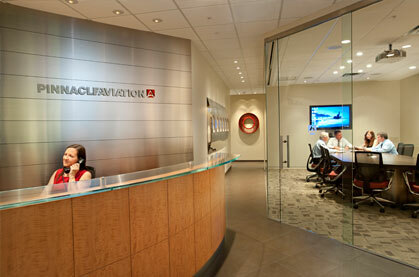 But then, you should expect nothing less from the professionals at Pinnacle Aviation.